Governor Terry Branstad says recent employee misconduct at the state-run facility in Glenwood for patients with profound mental disabilities highlights the need for a law change. Six employees at the Glenwood facility were fired, six quit and five others were disciplined after an investigation found 20 residents had been physically and verbally abused by the staff. Branstad tried to get that changed in 2013. The Republican-led Iowa House passed a bill on the subject, but Democrats in the Iowa Senate were able to block it, arguing the move would expose the state to defamation lawsuits. Now that Republicans have majority control of both the House and the Senate, Branstad hopes a bill will be passed that would make records about government employee firings open to the public. 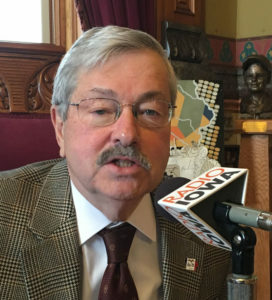 Branstad would like the law changed to apply to the firing of employees in city and county government in Iowa as well as firings in the state’s schools. In 2013, Democrats objected to the move, arguing at the time that Branstad was seeking the change to deflect attention from “hush money” payments to state employees who were being laid off. Some state managers made confidential settlements to give workers a departing bonus if the employee agreed to keep the terms of their exit agreement secret.